Content marketing success requires learning the business of content. Over the years I’ve been in the business of music, books, carving, blogging, and training. And I’ve gained international recognition for one simple reason. There’s a common thread running through them. Once you wrap your head around this concept, you’ll begin to see it in every successful endeavor. Let me give you an example or two. I live in Nashville. For minor work around the house I generally like to hire songwriters. They work a day job to support their habit. (I know, I used to be one.) And they tend to care deeply about doing a good job. I like that! I created a custom design for a tile backsplash in my kitchen and hired a songwriter to install it. He liked country music, so that’s what I put on the stereo while he worked. Suddenly I heard him yelling for me in such a way that I thought the tile was falling off or he cut his hand on the saw. He wanted me to listen to the song on the radio. I don’t remember it exactly, but the gist was of a couple spending the day out in the country and then checking each other later for ticks. It was a fun song. But my tile guy was so upset. He complained that he spent years honing his songwriting craft. And yet this was the junk playing on the radio. Music publishers don’t care if you can play, write, or sing. They care if you can sell a record. I’ve written lots of hook songs. And because of that, I’ve enjoyed airplay in 14 countries. Music publishers care if you can entertain people. Because, guess what? They’re in the entertainment business. Novelty songs are entertaining. Everybody’s talking about them. That’s the point. And that’s why the “check you for ticks” song goes viral quickly compared to well-honed, craft songs with the best studio players money can rent. During my first year in college as a music major, we took a tour of RCA Studios. I remember (and I’m so going to date myself here) the guide walking us through the mailroom where there were stacks of duffle bags brimming full of unsolicited cassette tapes. I have never forgotten that. It’s the raw power of promotion. Publishers tell their audiences what they want. They create desire. And folks just gobble up whatever is hot. That’s the business of music. But, since I’m a webmaster, of course I created a site so my friends and family all over the country could see how much fun I was having. And so that I could sell enough carvings to support my habit. One day, out of the blue, a magazine writer contacted me to see if I’d like to have a feature written on my carvings. “Sure!” I replied. She pitched the idea to her editor, Fox Chapel Publishing. This is the publisher in carving that produces several books and magazines on the topic, including Wood Carving Illustrated. Over the next several months I was featured in all of the magazines, and offered a paid tutorial, which I accepted. And, I was offered a book deal. The publisher pitched me, not the other way around. From all the activity on my site and social media platforms at the time, they knew I could help them sell magazines and books. And that’s the key. A book publisher doesn’t care if you can write a book. They care if you can sell a book. I haven’t done that book yet. I had a little too much bone in my shoulder, and the minor surgery to remove it sidelined carving for a while. Then BlogAid took off. And I’m just now getting back into that hobby – 4 years later. Right now I don’t have time to run another business. And that’s what signing a book deal is. Not only do I have to write the book (and take a billion pictures of carvings, works in progress, and sketches, etc.) I also have to promote the book. I’ve heard many authors say they have written thousands more words promoting their book than are in the book itself. I do have a published book, just not on carving. (See it here.) It was featured in Publishers Weekly shortly after its debut. I enjoyed a couple of lecture tours with it. I spent 4.5 years researching, and another year writing it, or rather editing it down to 400 pages from my extensive notes. I didn’t expect to sell a lot, although it did the first year. But I definitely didn’t intend to keep promoting it, or to write a follow up book. I published it because I thought it would be useful to other seekers who had some of the same questions I did. And it was. And I’ve moved on. I learned a bunch about the business of books. If I ever do another one, I’ll sell it before I ever write a single word of it. You may be shocked to learn that’s done all the time. Pro writers don’t create whole books and then try to pitch them to publishers. They write outlines and pitch those to both publishers and their audience. then the book idea is given a green light. Only then is the actual book written. That’s the business of books. Where Does Blogging Fit In? Stop thinking like a blogger. 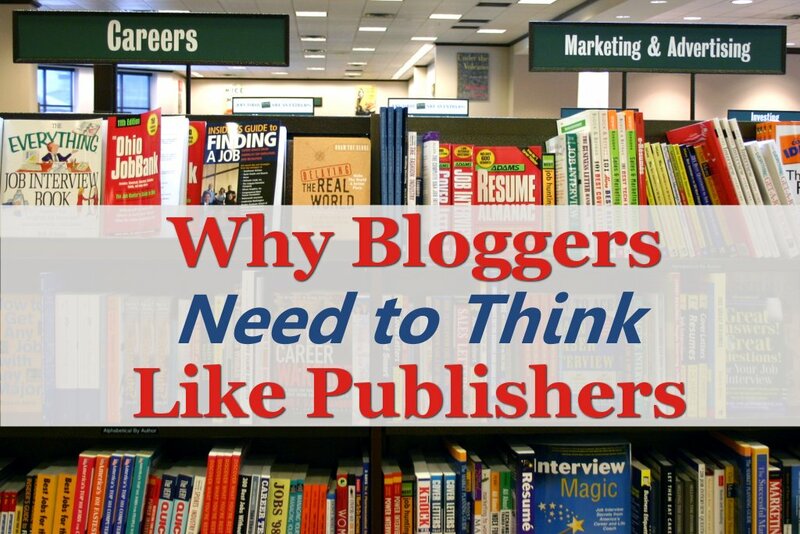 Start thinking like a publisher. That last one is, literally, the bottom line. That’s the business of business. If you can answer yes to all of the questions above about your blog post, then the only thing left to do is promote, promote, promote, promote. No one else is going to make it go viral until you make it go viral first. You’ve got to promote it like your livelihood depends on it. Because in reality, it does. Publishers have to sell music and books to stay in business. Bloggers have to convert to stay in business too. That could be clicking on ads, opting in to your newsletter, following you on social media, making a purchase, etc. Do you see how a publisher thinks now? Is your thinking the same or different? That is the clearest portrayal of how and why to blog that I have ever read MaAnna. And I have been reading problogger, smartpassive income, boostblogtraffic, copyblogger, bloggingwizard, digitalmarketer, quicksprout etc for some time now. The difficulty lies in helping others to “catch my cold”. Wow Jeremy!!! Thank you for the awesome compliment! That’s pretty big company to be listed with. And you definitely know how to write a hook > catch my cold! !